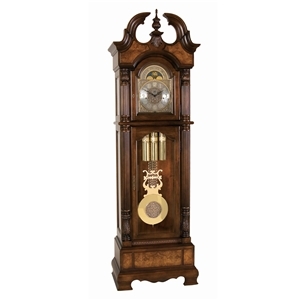 This stately floor clock features Royale Cherry finish on genuine hardwoods with Cherry and Olive Ash burl veneers. The Olive ash burl is mounted on raised panels over the book matched Cherry on the front of the top crown. The beautiful shape of the stepped swan’s neck pediment with a carved finial rests upon the wonderfully carved shell design located under the finial seat.